One of my favorite breads I’ve made this year is farinata. This Northern Italian speciality, made basically of chickpea flour and luxuriously copious amounts of olive oil and black pepper, results in such a delectable bread that it is worth every minute spent tracking down the crucial main ingredient: chickpea (or, gram) flour. And, like most very simple breads, I couldn’t help but meddle with the formula. The item that resulted from adding almond flour and my stubborn ignoring of the proper cooking method was, shall we say, not as good as the original. Perhaps if I had been more careful and thought it all through, things might have gone differently, and I would’ve had a new recipe to add to the permanent file. As it was, the bread stuck badly to the not-hot-enough pan, the flavors were muddy and unbalanced, and the result was simply not that great. So, rather than risk a repeat performance (or lack thereof), I elected to leave the farinata method to the farinata, and create a different bread altogether, with the same and unadorned flavors of chickpea and almond. Knowing that such gluten-free flours would never produce a decent yeast-risen loaf, it had to be some sort of flatbread. Crackers, I though, would take particularly good advantage of the natural coarse textures, so that’s the route I took. I mixed in a bit of all-purpose flour to help hold everything together, instead of just crumbling into oblivion when bitten. Taking a single flavoring cue from the original farinata, I added a generous helping of black pepper, intensified with a pinch of cayenne pepper. 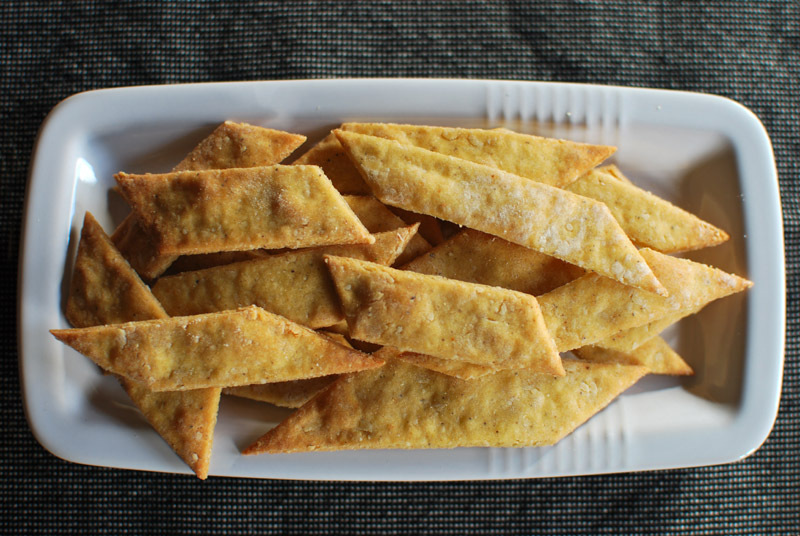 The golden crackers I pulled from my oven filled the kitchen with a nutty, spicy aroma. They weren’t the most crisp things I’d ever tasted, but I had rolled them fairly thick, so it wasn’t a surprising state of affairs. (If you prefer a crisper cracker, roll them very thin, and dock the surface with a fork before baking; otherwise, they’ll just puff up.) The bite of pepper was certainly present, but it built gently and pleasingly on the back of the tongue, rather than brashly announcing its presence at first taste. The chickpea flour did bring a slightly dry characteristic to the crackers, a state that might be ameliorated by letting the dough rest overnight (and fully hydrate), as opposed to the 30-minute cat nap I gave it. But dip these full-flavored guys in some hummus, and you’d never notice the difference. (Take it from one who knows.) These crackers, though not exactly like the original attempt at mixing chickpea and almond, were a far better way of blending the two flavors. Finally, I’ve got a recipe worth hanging on to. 1. In a bowl, whisk together the flours, salt, and peppers. Add the olive oil and 1/4 cup of water. Mix together until a shaggy dough forms. Add the extra water by tablespoons as needed until all dry ingredients are moistened. Knead together, in the bowl or on a work surface, until smooth. Cover with plastic wrap, and let rest at least 30 minutes. Preheat the oven to 400º F.
2. On a lightly floured surface, roll out the dough to a rectangle, about 15 x 10 inches in size, or about 1/4 inch thick. Using a pizza cutter, knife, bench scraper, or cookie cutter, cut out crackers of desired size and shape. Gather any scraps together, knead quickly until combined, and let rest 10 minutes before re-rolling. 3. Transfer cut-out crackers to a large parchment-lined baking sheet, and bake at 400º F for 7 to 12 minutes, depending on size, until barely golden brown. Transfer to a wire rack to cool. 1. After mixing the dough, it can be wrapped tightly in plastic wrap and refrigerated overnight. Let come to room temperature for 30 minutes before rolling out. 2. Dough should not be re-rolled more than once, as the crackers will toughen with every re-rolling. Cutting out square or diamond shaped crackers will obviously eliminate the need to re-roll scraps, though I fully understand the appeal of, say, bunny or flower shaped crackers. 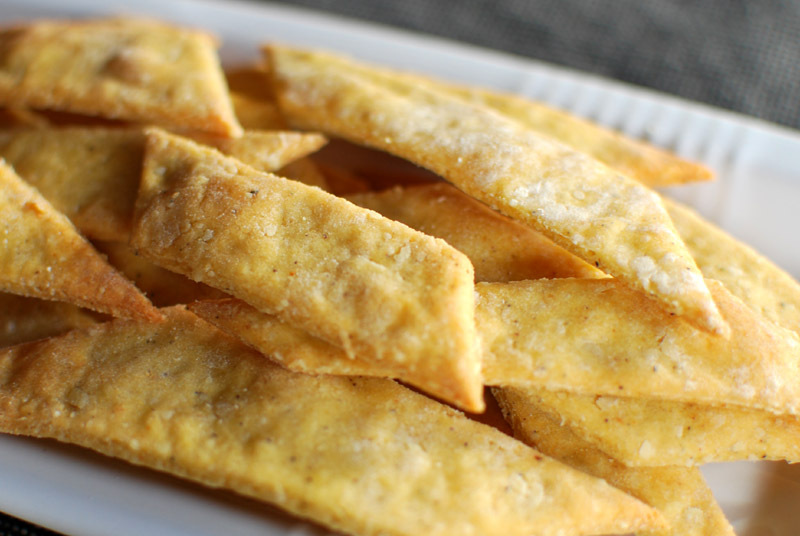 Those crackers look amazing, and I love anything with chickpea flour in it. My problem is that I have no access to almond flour, could you please suggest another kind that could work well and give flavour? Elisabeth: You can always make your own almond flour, by grinding skinned almonds in a food processor until fine. Add a little chickpea flour or all-purpose flour in, though, so you don’t end up with almond butter! If that’s not an option, you can use any other nut flour available to you. I’m sure you could experiment with any kind of non-wheat flour, though; rice flour would make for a nicely sticky cracker, and teff flour would give an earthy and coarse flavor, but I think I’d have to go with buckwheat flour, since I just adore the flavor. I think the taste would complement the chickpea flour pretty well (no guarantees, however, I haven’t tried it!). Good luck!